Well, not really FO: they need to be laced up, trimmed and ends woven in. They are breathtaking! What a great design. Danielle,these look great! Can't wait until the book comes out to see what everyone made! So glad you are still finding time to crochet! 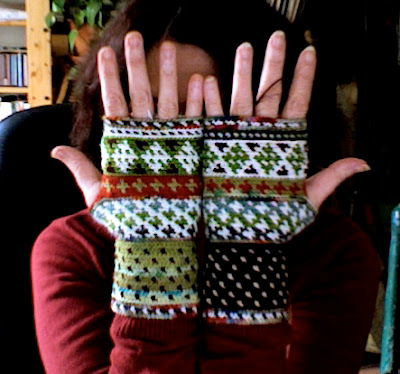 I love your wristwarmer designs more than just about anything, ever. Wonderful design! I'm really looking forward to the book. For now, I'll just stare in wonder at your work! Really cute!!!! love the colors!